İstanbul Research Institute presents the exhibition “An Ottoman Building in the Early Republican Era: The Şişli Mosque” with a selection from Suna and İnan Kıraç Foundation Photography Collection. The exhibition focuses on the first monumental religious building of the Republican era of İstanbul through selected photographs and documents. Located on the corner where Abide-i Hürriyet and Halaskargazi avenues intersect, Şişli Mosque’s architect, Vasfi Egeli, is regarded as one of the last representatives of the First National Architecture style that combines late Ottoman and early Republican periods. 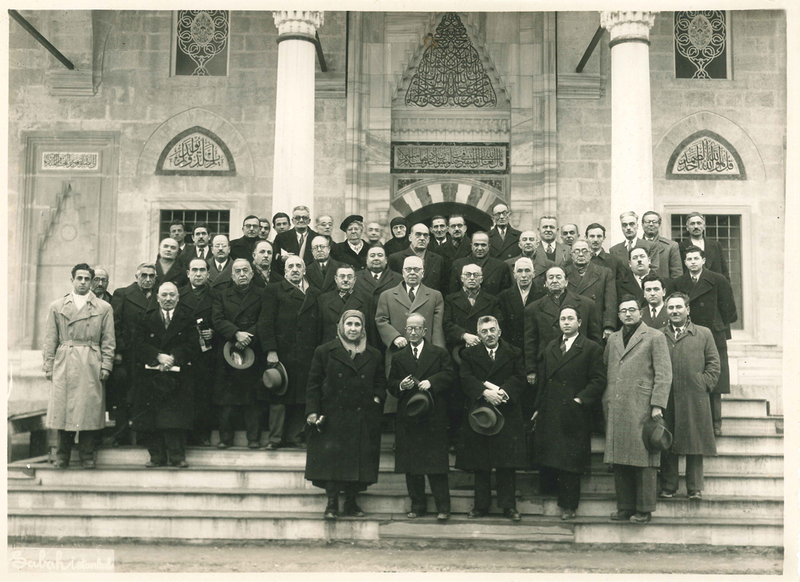 Vasfi Egeli (front row, third from right) and others involved in the construction of the mosque, standing before the mihrab. 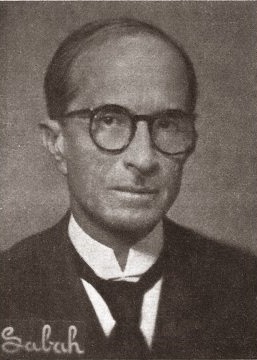 Vasfi Egeli was born in İstanbul as the son of the chamberlain Ömer Lütfi Bey, and graduated from Sanayi-i Nefise Mekteb-i Alisi (Mimar Sinan Fine Arts University) in 1913. He gained experience in the restoration of Ottoman works by working under Kemaleddin Bey, the chief architect of the Administration of Pious Foundations, Ali Ta’lat, and Mehmed Nihad [Nigisberk] as member of the construction board of the Pious Foundations. Following the retirement of M. Nihad Bey, he became the chief architect of the Pious Foundations and carried out the restoration of numerous works, among which were the Süleymaniye, Şehzade, Edirnekapı Mihrimah Sultan, and Hırka-i Şerif mosques as well as the sultan’s pavilion at the New Mosque. He also directed the extensive repairs of architect Sinan’s tomb in Süleymaniye, and renewed the Ağa Mosque in Beyoğlu in 1938 in the classic style. Built in 1947, the Feneryolu Mosque is an unassuming work designed prior to the Şişli Mosque. 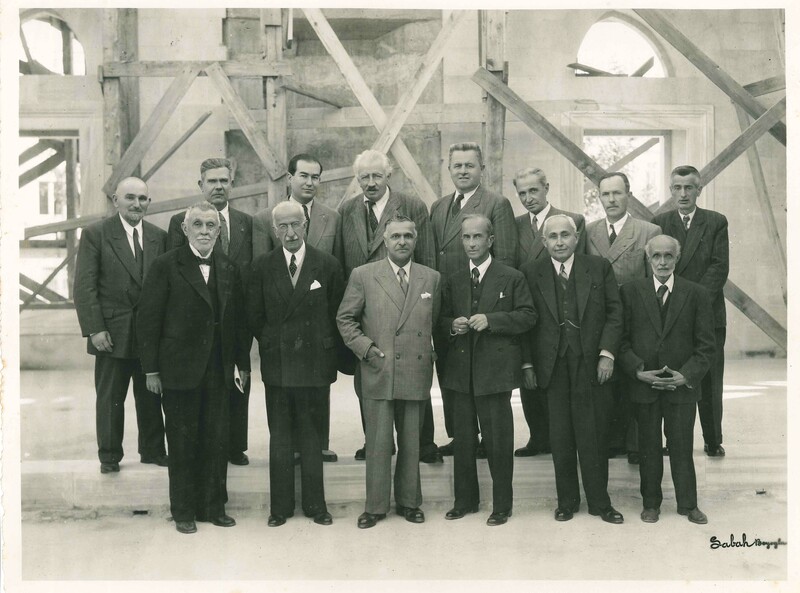 Vasfi Egeli (front row, second from left) and others involved in the construction of the mosque, standing at the entrance. “The Şişli Mosque: An Ottoman Building in the Early Republican Era” exhibition can be seen at İstanbul Research Institute until May 28!